Northland is so close to those who live or visit Auckland, but for some reason few people really scratch the surface. It’s such a shame, as it’s a region with so much to offer and lots of hidden gems. Over the New Year break a few years ago, a group of us decided to do a Northland road trip. Shaun and I were in our trusty campervan Bessie, and the others camped in tents. Our first stop was Kai Iwi Lakes, just inland from the west coast of Northland near Dargaville and only a couple of hours north of Auckland. It was crappy weather so we didn’t do much (except play on the playground), but it was a nice place to spend our first night. The only bummer was that all the pine trees that used to grow around the campsite and along the lakeshore were no longer there (I had visited a few years before) so it was pretty exposed to the weather. The following day we headed north along the western side of Northland, through the Waipoua Forest. The forest is magnificent – here live some of the biggest trees in the world, the mighty Kauri. These trees are so massive that it’s hard to comprehend that it’s actually a living thing! We carried on north until we reached the Hokianga Harbour, where there are huge sand dunes on the northern shore. 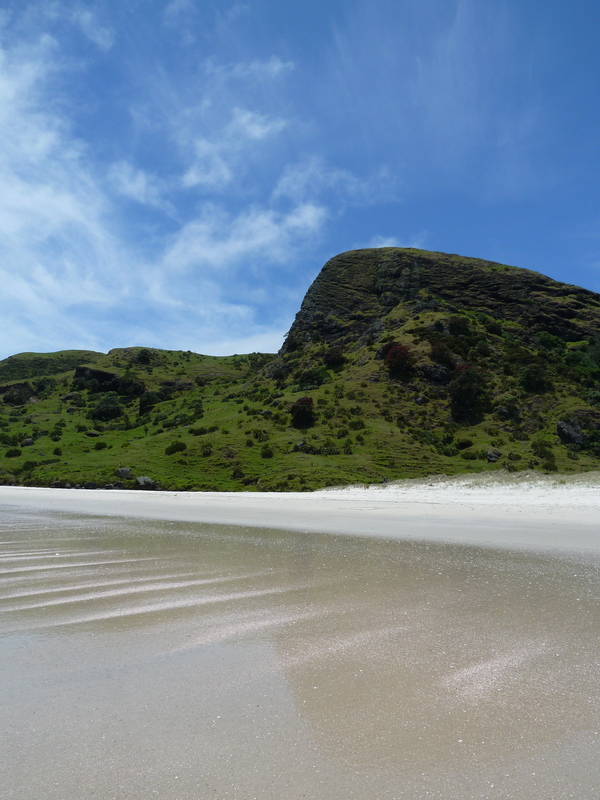 As a kid I visited the Hokianga on many occasions, and sometimes we went sand boarding down these dunes right into the harbour! Such fun! After lunching at a lovely waterfront cafe in Rawene, we caught the car ferry across the harbour and continued north through Kaitaia (the biggest town in the Far North, and the last decent supermarket for a while) to our next campsite at Rarawa Beach, on the east coast. This campsite is managed by the Department of Conservation, and is a steal at only $6 per person, per night. The beach is stunning – pure white sand and sparkling turquoise water. The following day we headed to the top of the North Island, to one of our favourite places in the whole country: Spirits Bay. Yet another DOC campsite is located here, and the best thing about this place is that there is no development for as far as you can see. The beach is about 9 km long and the water is lovely and clear and warm (for New Zealand standards!). You can often see dolphins just off the beach! It’s quite honestly like paradise. We had a couple of great nights at Spirits, and on one of the days we headed to Cape Reinga. Most people think that it’s New Zealand’s most northern point, but it’s actually not – that honour goes to North Cape, which is further east and inaccessible by road. Cape Reinga is a big tourist attraction so there were heaps of people there, but there are amazing views down the west coast and across to Spirits Bay, so it’s a must-do for anyone visiting this part of the country. For New Year’s Eve we headed south to Tokerau Bay, where our friends Pia and Mike were staying. On the way our dear campervan Bessie had a mishap – the power steering belt shredded! So we limped our way from Spirits to Tokerau Bay with poor Shaun wrestling with the steering wheel. Thank goodness it was nothing more serious! It was a fun New Year’s Eve at Tokerau Bay, and lovely to spend time with good friends. We spent a day at Matai Bay (yet another one of our favourite NZ beaches) – if you’re lucky enough to get a campsite at this extremely popular spot over the New Zealand summer, do it! The beach is just stunning. Another great beach to visit is Puheke Beach, only about ten minute’s drive from Matai Bay. This beach is a lot quieter (no campsite or houses here!) and has amazing white sand and nice dunes. Beautiful! A large group of us enjoyed a yummy wine tasting and lunch at one of the few wineries in the area – Karekare Estate. After Tokerau Beach, the rest of the group headed southwards back to Auckland, and Shaun and I drove to the Bay of Islands where my parents own a bach (holiday home). I’ve been going there my whole life for summer holidays – so lucky I know! – and in the last seven years Shaun has spent a lot of time there too! We love it so much, and it’s hands down my favourite place in New Zealand. While we were there it was a significant birthday for my Mum so we gave her a helicopter flight over the Bay of Islands to celebrate. To my surprise, my Dad booked me on the flight too! It was an amazing experience, one that I will never forget. Having spent so many years on the water and the beaches of the Bay of Islands it was certainly something else seeing it from the air! Seriously, how could you not love this part of New Zealand?! Northland is amazing. The beaches are so beautiful it blows my mind, and there are so many little-known spots where you can escape from the summer crowds. Northland will always hold a special place in our hearts! See our other New Zealand campervan road trip posts here! Thanks to Claire Scofield for allowing the use of her beautiful photos of Northland in this post (CS in the captions) – my camera was out of action. Wow – I love the shots from the helicopter – What a neat experience! Thanks Emily! The helicopter flight was incredible – so lucky that we got a beautiful day for it too! PS. your blog looks great, hope you’re having fun in India! Thanks Lucy! I must give credit to my friend Claire for most of the pics in this post as my camera was broken 🙂 It is such a stunning part of New Zealand – I hope you get there some day! WOW! The places are drop-dead gorgeous! 😮 It makes me miss travelling around New Zealand as I’ve only been down to Wanganui and Wellington once or twice. Northland is such an underrated region! The beaches are just spectacular aren’t they? Thanks Ciana!